Many readers find the Isaiah passages in the Book of Mormon difficult, either wading through them hoping they can get on to plainer speech, or skipping them altogether. An old joke that used to be passed along tells about the soldier who carried a Book of Mormon with him into battle right over his heart. Why? He said that not even a speeding bullet could get through 2 Nephi with its Isaiah passages. To take that approach is to miss some of the most beautiful and insightful chapters of scripture. Indeed, when the Lord visited the Nephites he quoted Isaiah 54, and then said, “And now, behold, I say unto you, that ye ought to search these things. Yea, a commandment I give unto you that ye search these things diligently; for great are the words of Isaiah. For surely he spake as touching all things concerning my people which are the house of Israel” (3 Nephi 23:1.2). If Christ calls the words great, surely they are to be studied diligently which means carving out a portion of your life to do that. Forty minutes in a Sunday School class can only give the merest appetizer to the great feast that awaits in Isaiah. Nephi, too, rejoiced in the words of Isaiah. “Yea, and my soul delighteth in the words of Isaiah” (2 Nephi 25:4). Indeed, Nephi and Jacob, who both quote Isaiah, lived about the same amount of time from Isaiah as we do from Joseph Smith. Their extensive quoting of him (much as we quote Joseph Smith) shows the enormous respect and love they had for him. Donald W. Parry and Jay A. Parry give us this background on Isaiah, the man. “Isaiah’s name means ‘Jehovah is salvation.’ How fitting that a man who devoted his life to testifying of the saving power of the Messiah should also have a name that so testified. “Many scholars believe that Isaiah’s ministry took place between the years 740 and 700 (or perhaps 699 B.C.“approximately forty years. According to Isaiah 1:1, Isaiah served as a prophet during the reign of several kings in Judah, including Uzziah, Jotham, Ahaz, and Hezekiah. He had personal dealings with at least of these kings. According to one ancient Jewish source, Isaiah’s wife was a daughter of one of the kings of Judah, making Isaiah a member of the royal family by marriage… “According to Josephus, Isaiah was martyred for the faith. King Manasseh, who took rule at the early age of twelve, reportedly put Isaiah in a hollow tree and had him sawed in half (Hebrews 11:37 may be an allusion to this). What was happening in the political world of Isaiah’s time? Assyria, the enemy of Israel, was expanding its borders through whatever means necessary. In 722 and 721 B.C., midway through Isaiah’s ministry, Assyria invaded the northern kingdom of Israel and carried its inhabitants (the ten tribes of Israel) off into other lands..
“After conquering the Northern Kingdom of Israel in 721 B.C., Assyria sought to take over the Southern Kingdom of Judah, taking two decades to advance to the city of Jerusalem. Hezekiah and his people were frantic, but Isaiah gave a prophecy of reassurance and comfort: “Therefore thus saith the Lord concerning the king of Assyria, He shall not come into this city, nor shoot an arrow there…for I will defend this city to save it for mine own sake…Then the angel of the Lord went forth, and smote in the camp of the Assyrians a hundred and fourscore and five thousand” (37:33-36). One of the challenges in reading Isaiah is that he has seen a sweeping view of the earth’s history with glimpses that span the premortal world, spirit prison, the ministry of the Savior, the history of the House of Israel, conditions at the Second Coming and much more As he records his message, it is not necessarily in chronological order. Sometimes he is speaking of past events, sometimes of future ones, sometimes of the present, and often he is speaking of all of them at the same time. As is often true in prophetic utterance, what happened in the past is only a type of what is to come again, so multiple occurrences through history can be spoken of as if they were just one. Acknowledging that Isaiah spoke many things that were hard to understand, Nephi, in 2 Nephi 25, gives us some keys to unlock some of the confusion. Understand “the manner of prophesying among the Jews” (25:1). The meaning of prophetic speech is concealed to us when we commit evil acts. 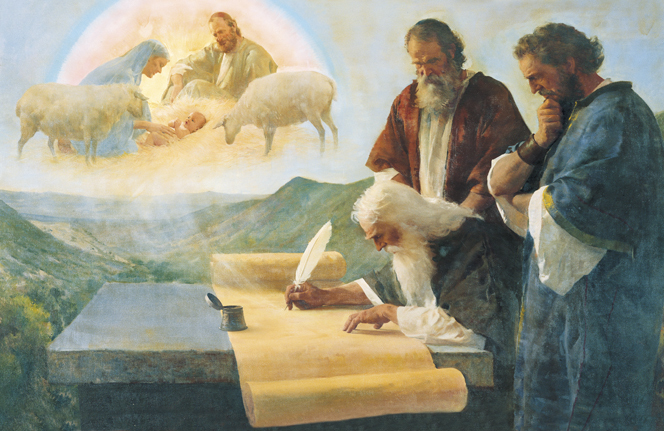 Don Parry points out that “When Laman and Lemuel complained that Lehi had taught things that were ‘hard to be understood’ (1 Nephi 15:3), Nephi asked them, ‘Have ye inquired of the Lord?’ He then provided a formula for understanding the prophetic word, including Isaiah’s teachings: ‘If ye will not harden your hearts, and ask in faith, believing that ye shall receive, with diligence in keeping [his] commandments, surely these things shall be known unto you’ (1 Nephi 15:11). Those who are involved in works of darkness and who break the commandments never understand the revelations of God or the things of the prophets. Dr. Parry said, “It is natural that the reader be required to possess the spirit of prophecy in order to understand Isaiah’s words, because the same spirit of prophecy provided or prompted the words of revelation to Isaiah, subsequently, it can provide those who diligently search Isaiah’s prophecies with the interpretation of Isaiah’s words. Isaiah speaks often about the place-names around Jerusalem. There are more than 100 different geographical names mentioned in the book. Some of these stand for themselves as well as as a symbol for a larger idea. Dr. Parry points some of these out: “Sodom:..Inhabitants of the ancient cities of Sodom (with Gomorrah) committed enormous sins…Isaiah used Sodom as an example of a wicked city that was judged and destroyed by the power of God, never to be rebuilt, and he prophesied that other cities would be similarly destroyed by God’s power around the time of the second coming of Christ. Hence, Sodom symbolizes all wicked cities of the last days that will suffer the judgments of God. “Assyria…As the scriptures indicate, Assyria represents warring nations of the last days. …However, although they succeeded in deporting the northern tribes of Israel from the Israelite homeland, the God of Israel will prevail against the modern Assyrian nations and they will be burned as ‘thorns and briers’. Jerusalem…Isaiah’s titles for Jerusalem point out her sacred mission and prophetic calling as the place where the infinite atonement of Jesus Christ would take place. Many of Isaiah’s prophecies of the last days are being fulfilled. The building of temples, the lifting an ensign to the nation, good being called evil and evil good, the welcoming of the Gentiles into the covenant“all are prophecies from Isaiah that we are wtinessing unfold around us. A goodly portion of my daily scripture study over the past 10-15 years has included a serious effort to better understand the teachings of Isaiah by creating my own version of his entire book. I began with the KJV in black ink; I brought up explanatory footnotes and inserted them exactly at the word/phrase they enlarged upon, in red ink; I inserted many of the comments of Cleon Skousen from his verse by verse commentary ("Isaiah Speaks To Modern Times) in purple ink (he offers more historical insight than any other author I have read); I inserted BOM differences from the KJV in green ink; I inserted many comments from Monte Nyman ("Great Are the Words of Isaiah") in brown ink; and finally many D&C relevant quotes in blue ink. I read from Isaiah every day. The insertions are very helpful. I'm actually just beginning to understand a little about what's going on. In short, a casual, infrequent approach to Isaiah probably won't work, at least it didn't for me.. Everyone's approach is different. Find one that works for you. The key is: STICK WITH IT EVERY DAY! Pray for understanding every day. Line upon line, here a little and there a little, the pieces begin to fit together. I have taught Gospel Doctrine classes for nearly 11 years, in 2 wards. I always dreaded teaching Isaiah and 2 Nephi until I read, Understanding Isaiah by Parry, Parry & Petersen. I literally "fell in love" with Isaiah. I recommend the book to anyone who wants to understand these scriptures.